When approaching a narrow channel, stay to the starboard side and, using a prolonged blast, announce your approach to vessels that may be around the bend. When operating within a narrow channel, vessels must keep as near as is safe and practical to the outer limit of a narrow channel on their starboard side. Sailing vessels and vessels less than 65 feet in length cannot block the passage of a vessel that must restrict its navigation to a narrow channel (that is, recreational boaters traveling in a main channel should give way to larger vessel such as tugboats). In order to comply with Homeland Security Measures, avoid anchoring in narrow channels and beneath bridges. When operating near a shipping lane or in areas of high boat traffic, smaller craft are not easily visible to larger vessels. Always keep a lookout for larger vessels and be prepared to yield the right of way. 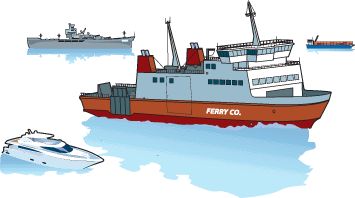 Specifically, always steer well clear of vessels in tow, docked ferries, or ferries in transit. Be mindful of cable ferries pulling other vessels—the cable might be submerged and difficult to see. Do not get in between a ferry and its tow. Keep an ear out for one prolonged blast from a horn, as this may be indicating a departing dock. Operators of smaller craft should attempt to travel in a group if at all possible, in order to be more visible.